Browse: Home / Progressive Jungle Anxiety? To dine on the island of Penang, we must cross Malaysia from east to west. As the house crow flies, that’s 150 miles. As the bus rumbles, it’s six hours. At the finish line in Butterworth I’m wound up, thinking, “Yeow! Have I seen denser vegetation? Have I seen a more challenging landscape that wasn’t covered in snow or sand?” The six hours included a gear-grinding 4,000-foot climb and a break-smoking 4,000-foot descent. In the lowlands, people appear to win for a while over the jungle. Need a product built? Carve a space out the forest near the road (and near a right-sized town), and build a factory. We passed half a dozen of these installations in the coastal plains around Kota Bharu. Parts and materials are trucked in, finished goods or subassemblies are trucked out. Not one of the facilities looked older than ten years. 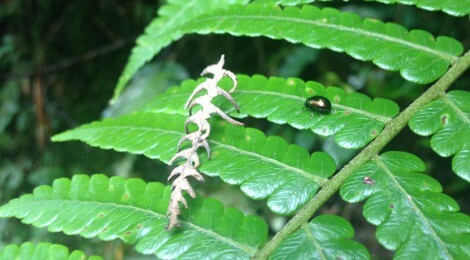 How long will they produce before the jungle reclaims them? As we start to climb, the factories and townships drop away and, though we might have thought it impossible, the green thickens. I know we’re in another world when a wordless yellow warning sign flashes by: tapir crossing. Watch out! There may be heavyweights in the road! 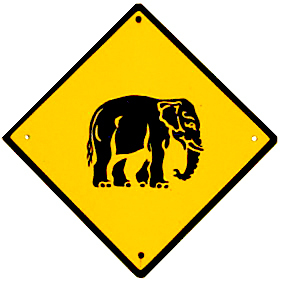 We are really deep in the green when another yellow warning sign flashes by: elephant crossing. I know this is a slow bus, but shouldn’t we be going even slower around these curves? In the bus-collides-with-elephant scenario, don’t we all lose? As we wind our way through the heart of the green teeth that are the Titiwangsa Mountains, we are lashed by thunder, rain, and lightning, and then blinded by sunshine. Shower, glister. Shower, glister. Shower, glister. From the bus window, it’s almost impossible to see brown earth. All the surfaces, except pavement, the concrete rain gutters managing runoff in the road cuts, and one or two mountain crags, are used for photosynthesis. We pass at least four work crews valiantly trying to keep the jungle from returning the road to leafy wilderness. It’s no wonder there are warning signs for tapir and elephant…there is no chance a driver would see them before they were on the asphalt. The underbrush is too dense, too close to the ground, too close to the road. When we swoop down to the narrow bridge across Temenggor Lake, the situation at the water’s edge appears equally claustrophobic. There is no conventional shoreline, rather a green edge of moss or grass, which in just a foot or two graduates to ferns and bushes, and in another foot or two it’s the head-height branches of the lowest trees. Then the jungle canopy takes over. The vegetation feels denser than my experience in the Ecuadorian Amazon, where low brush did not dominate every inch of periphery. Only at our late lunchtime near Gerik do I get to see the earth, and only then because other people have plowed it. Vegetable patches ring the truck stop and its open-air restaurant. The locals may farm, but they can’t keep the jungle back. Creeping into the vegetables are primordial looking branching ferns more insidious than ivy. Maybe we don’t need the tapir and elephant warning signs after all. Maybe they can’t escape the fence of low-lying vegetation at the natural boundaries of the forest. Finally, released down into the plains around Butterworth, the factories—dozens more than in the Kota Bharu area—and other familiar sites begin to crop up. A stoplight. A tollbooth. Pastures. A somewhat more familiar sign on the road outside of Butterworth. The undergrowth isn’t as pushy here, but you can still sense the depth of the green and the crowded nature of the forest. Click the photo to enlarge. I let out a breath that maybe I’ve been holding for a hundred miles. How can a forest get me to clench my shoulders like that? How? When it’s a most remarkable and unsettling forest. My attempts to take photos of elephant and tapir warning signs were a failure, so I’m showing a similar sign from Thailand. I am grateful to the photographer, David Crow, for making his work available via the Wikimedia Commons. 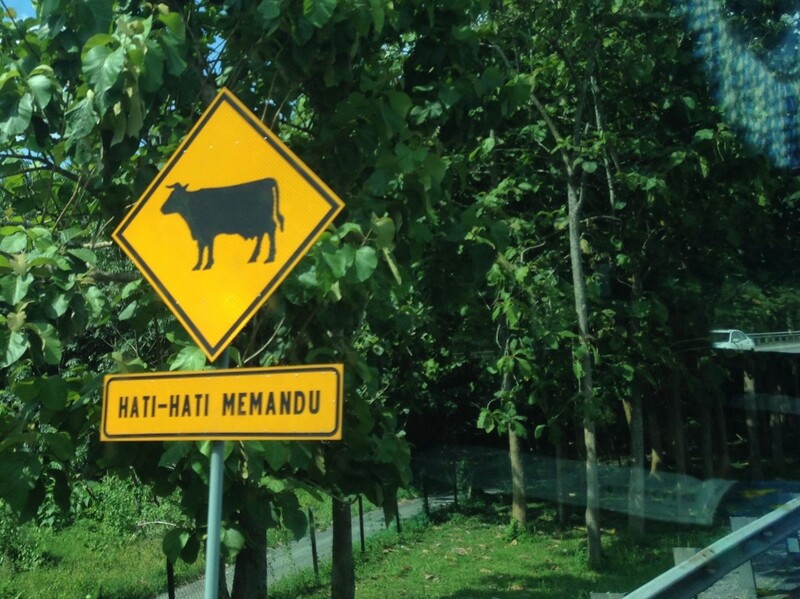 The Malaysian version is less of a line drawing and more of a block print, similar to deer crossing signs in the US.